A couple of weeks ago I piled into the car with Tom, medicine my parents and my sister-in-law and journeyed to South Beach for the Wine & Food Festival. Each year we get tickets to the Grand Tasting tent which is essentially a big tent filled with samples from local restaurants and wine tastings galore. It’s foodie heaven. So, with empty stomachs and high hopes we headed in to the tents to pig out. Sadly, I was disappointed with most of the food this year. It was mostly forgettable and a lot of places ran out of food by 4pm. (Hello recession!) Of all the things I tried that day, there were a few standouts. 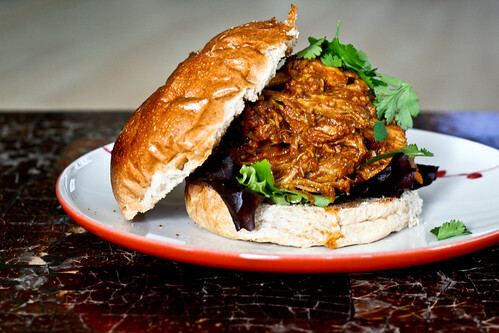 One was an Indian-spiced pulled pork sandwich which I used as inspiration for today’s dish. Some others were pork belly sandwiches from Le Meridien, cornbread with olive oil from Bizcaya (weirdly delicious! ), bread pudding with vanilla butter from the La Puglra table, and ratatouille from the Whole Foods pavilion. In fact, the Whole Foods pavilion was an all-around winner! So back to the pulled pork…I know that a lot of you are interested in pressure cooker recipes, so here’s another one for you. If you don’t have a pressure cooker, you can easily make it in a dutch oven or your favorite big pot. Pork loin is browned, then simmered with onions, tomato, lemon, hot curry powder, mustard seeds, bay leaves, tomato paste and stock. The onions and tomatoes melt into the liquid to make a spicy, delicious sauce that’s perfect on a bun. I think I’ll add a couple of cucumber slices and some cilantro yogurt to the sandwich next time just to add some contrast, but overall it was delicious. The kind of sandwich that’s a little messy, a little spicy and perfect any time of year. It’s one of those things that tastes even better the next day so make a big pot of it and enjoy it all week. Set your pressure cooker (or a large pot or dutch oven) over medium-high, then heat the oil. Once the pan and oil are hot, add the pork and brown for a few minutes on each side, seasoning with the salt as you go. When the pork is browned, add all remaining ingredients and give it a big stir. If using a pressure cooker, seal the pot and turn the pressure knob to the locked position. Once the pressure valve pops up, reduce the heat to medium-low and cook for 45 minutes. Remove from heat and let the pressure steam come down, then turn the valve to the “release” position. Open the lid away from your face. If using a regular pot or dutch oven, bring the liquid to a boil, then cover, reduce heat to medium-low and cook for 2 hours, stirring occasionally. Remove from heat. Remove the lemon peel and bay leaves and discard. Using 2 large forks, pull the pork apart. It should be tender enough that it just falls apart. Stir the pot so that all of the pork is evenly coated in the sauce. Assemble your sandwiches by layering the salad greens, then the pulled pork, cucumber, yogurt and cilantro. Top with bun and serve. I’ve got pulled pork leftover from the other day, so I think I’ll take the general flavor idea and run with that to make a quick version of your sandwich! Looks great! Oh gosh, I am absolutely going to be making this with the other hunk of pork in the freezer! The last one went into BBQ pulled pork, but this looks like a good alternative! Ooooh a contender to what we’re used to. That looks like a big ‘ol sammie! Sounds awesome- all of my favorite flavors wrapped into one dish. Looks great, but I bet you’re right, needs some yogurt and crunch from the cucumber. I am making it right now in the pressure cooker. Can’t wait!